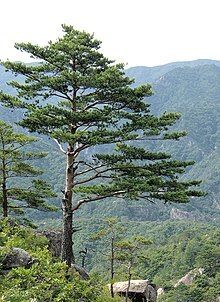 A pine is ony conifer in the genus Pinus, o the faimily Pinaceae. Pinus is the sole genus in the subfaimily Pinoideae. The Plant List compiled bi the Ryal Botanic Gairdens, Kew an Missouri Botanical Gairden accepts 126 speshies names o pines as current, thegether wi 35 unresolved speshies an mony mair synonyms. This page wis last eeditit on 24 Februar 2018, at 20:49.